On March 17, 2019, the state visit of His Majesty the King of Bahrain Hamad Ibn Isa Al Khalifa to Turkmenistan began. In the evening of the same day, in the residence of a high-ranking guest, he met with businessmen from Bahrain. On March 18, 2019, summit talks were held between President of Turkmenistan Gurbanguly Berdimuhamedov and His Majesty the King of Bahrain Hamad Ibn Isa Al Khalifa. 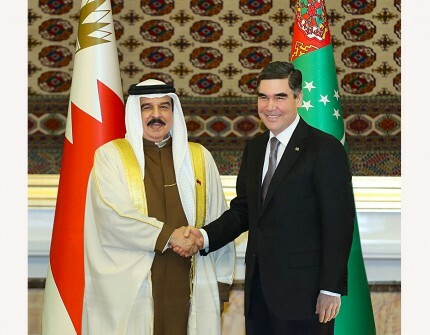 After the official ceremony of meeting and photographing against the background of the national flags of Turkmenistan and the Kingdom of Bahrain, President Gurbanguly Berdimuhamedov invited His Majesty the King to the Oguzkhan Presidential Palace Complex, where one-on-one talks took place. Further negotiations continued in the Soltan Sanjar hall in an expanded format, with the participation of the members of official delegations of the two countries. During the negotiations held in an atmosphere of friendship, the parties exchanged views on a wide range of issues. It was noted the desire for a comprehensive improvement of partnerships, which are an important condition for the further strengthening of peace, stability and progress in the region and in the world at large. In this context, the parties noted the close cooperation of Turkmenistan and the Kingdom of Bahrain within the framework of international organizations, primarily in the United Nations. The parties also expressed hope for expanding mutually beneficial cooperation in the political-diplomatic, trade-economic and cultural-humanitarian spheres. Special importance was given to fuel and energy cooperation. At the end of the negotiations in an expanded format, the ceremony of signing bilateral documents took place in the presence of the President of Turkmenistan and His Majesty the King of Bahrain. Then, the ceremony of handing to the King of Bahrain Hamad Ibn Isa Al Khalifa of one of the highest state awards of Turkmenistan - the Order “Bitaraplyk” (“Neutrality”) took place. Then the distinguished guest went to Kipchak, where he paid tribute to the memory of the first President of Turkmenistan, laying flowers at the Mausoleum and visiting the Turkmenbashi Spiritual Mosque. Then the cortege of the King of Bahrain traveled to the Monument of Independence of Turkmenistan, where the distinguished guest laid flowers and planted a tree in the Alley of Honored Guests. The State visit of His Majesty the King of Bahrain to Turkmenistan continues.